Mary, thoroughly enjoyed the poem and agree with the sentiment. 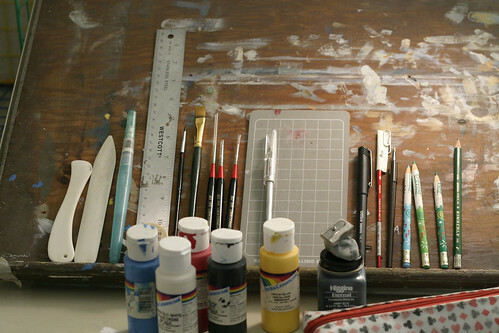 I love art supplies and always had plenty around when my kids were little — and I enjoyed the stuff at least as much as they did. My mother was an artists, specialized in portraits in oils. She told me she thought I had talent, but I was turned off because, I think, I didn’t want to compete with her. However, lately, inspired by a workshop at the Mass Poetry festival, I started playing with online tools like MS Paint and Gimp, mostly playing with photographs. I find the whole thing surpriingly engrossing. Thanks for the plug, Mary! I think each of us are artists in our own way. It’s giving ourselves permission to dabble that’s the hardest part. What if I fail or make a mess? Wasting time playing? Our Inner Critic has to be kicked to the curb when that logic takes hold. By the way, love your creativity box- a nice size to take on vacation. As to Mary’s box: Lin, your comment reminded me that when our kids were little, we always had a bag of stuff for the kids (markers, playdoh, a game or two, paper, etc) to amuse them with. All the kids were wonderfully amused by art supplies, thank goodness. Apart from the joy and release of playing with a medium that is not our usual one, I think there is so much to be learned from this kind of cross-fertilisation. From writing – and reading books about writing – I learn new ways to approach my art-making.